OAKLAND, CALIF. – (RealEstateRama) — International award-winning firm KTGY Architecture + Planning reports that the firm’s residential designs at two brand new neighborhoods by Toll Brothers in The Cliffs village of Summerlin, Granite Heights and Ironwood, have been selling at a brisk pace. Ironwood opened their models on June 8, 2017, and they have already sold 16 homes. The models at Granite Heights opened a week later, and the team has had 14 sales to date. Toll Brothers Group President Gary Mayo says that interest has been very strong for these contemporary home designs in the newly-selling Cliffs village and expects sales to continue at a good pace based on visitors to the community. The homes feature a collection of single-story open floor plans that offer multiple outdoor spaces including; enclosed front courtyards, covered rear loggias and private outdoor spaces off the master suite. Floor to ceiling windows with ceiling heights ranging between 10-16′ with transom windows in the raised areas let an abundance of natural light in. The project sits at the highest allowable point within The Cliffs which is located at the bottom of Red Rock National Park. 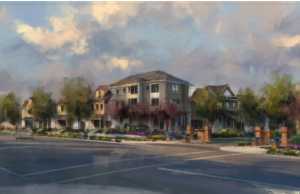 This strategic placement means permanent open space with no chance of development behind Ironwood or Granite Heights, Ramsey noted. Ironwood offers a total of 77 single-story homes on 65’x125’ lots, each embodying the village’s rugged contemporary design aesthetic and architectural style. Ironwood homes range from 2,516 to 2,823 square feet and are priced from the low $600,000s. Granite Heights features 85 single-story homes on 70’x120’ lots and range from 3,156 to 3,291 square feet with homes priced from the high $700,000s. International award-winning firm KTGY Architecture + Planning is pleased to announce that Muir Pointe featuring 144 single-family homes within two neighborhoods, The Cove and The Tides, will be the newest residential community to open at the 106-acre Bayside master-planned community in the city of Hercules, Calif. Built by Taylor Morrison, a leading national homebuilder and developer, and designed by KTGY, Muir Pointe’s waterfront location offers easy access to freeways and public transportation and provides a convenient commute to major employment centers in the San Francisco Bay Area. Models for the new community are currently under construction and are slated to open in February 2017.